My journey into cooking with umami and my understanding of MSG started in a surprising way. I was teaching charcuterie at a top culinary school. My class started at 6 AM with a short lecture in that first early hour of class. It was the day when the lecture covered various food additives that find their way into meat systems. Along the way, I made the comment that we were not going to be cooking with MSG. It was a “fact” that I had heard and simply accepted as such. After class, a Filipino student asked me what was wrong with MSG. I said something like “Well, you know it is not good for you.” (How I wish that I had been a better teacher on that day as I was teaching from a lack of knowledge—never a good idea.) My student responded that she did not understand as her mother used MSG every day in their kitchen at home. Then she asked me the key question, “Chef, have you tried MSG in scrambled eggs?” I then proceeded to do the only thing I did right that day—I asked her to make it for me. When I tasted it, it was one of those key moments in my development as a chef. I couldn’t believe how exceptional it tasted. It was certainly not like the scrambled eggs that I grew up eating. Instead, the flavor of the eggs was deeper, more savory, and delightfully more complex and interesting. And that began my journey into cooking with umami and MSG. 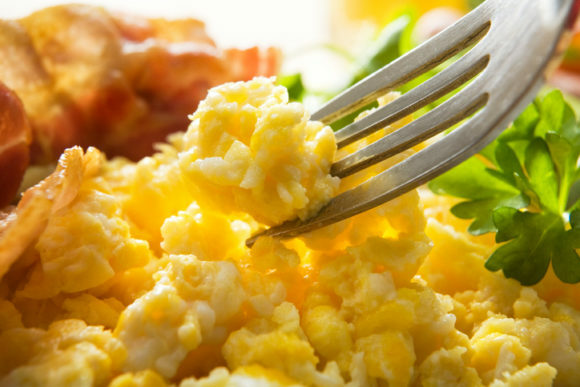 When I talk to people who are unclear of the flavor benefits, or even the taste of umami, I recommend the same scrambled eggs. They are easy to make and the flavor boost and umami hit are unmistakable. As MSG is umami in its purest form, it is easy to add to other preparations that equally benefit from a boost of the fifth taste. From my first trials with scrambled eggs, so many other dishes followed suit and were vastly improved by focusing on the umami content in them. I used a 2/3 salt and 1/3 MSG mixture to season the outside of various proteins before cooking them. I added MSG to grains, vinaigrettes, sauces, stews, soups, and vegetables. The results continued to impress as the umami notes grew to create a balanced and complex flavor profile alongside the other four basic tastes. So, try some of the recipes below or try cooking with umami by adding umami to your favorite recipes—and watch the taste fireworks happen! In a bowl, whisk together eggs, milk, MSG/salt mixture and pepper. Melt butter in a sauté pan over moderate heat. When the butter starts to froth, add eggs. Cook while stirring gently. When the eggs are cooked, but still soft and moist, remove from the pan and serve. 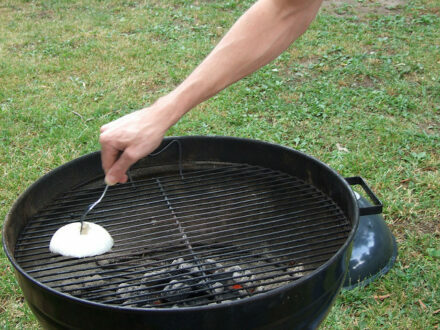 Place the onion slices on a moderately hot grill. Cook until the onions are soft and well-caramelized. Try not to get the onions too black as this will turn the vinaigrette bitter. Remove the slices from the grill and let cool. Place the onions and all the remaining ingredients in a blender. Process until smooth. Remove and refrigerate until needed. This recipe combines numerous sources of umami to create a true umami explosion. Serve it along with eggs or your favorite protein. In a large sauté pan, sauté assorted mushrooms in 2 Tablespoons of extra virgin olive oil. (It may be necessary to sauté them in 2 batches so that they brown nicely.) Remove from the sauté pan when well browned and cooked through. Reserve. In the same sauté pan, sauté onion and celery in remaining 1 Tablespoon of extra virgin olive oil. When the onions and celery are soft and lightly browned, add garlic. Cook for 2 more minutes. Add pepperoni or soppressata, diced shiitake caps, sautéed assorted mushrooms, reduced broth, sundried tomato paste, and MSG. Cook over moderate heat until the broth has reduced most of the way. Taste for additional salt and black pepper as needed. 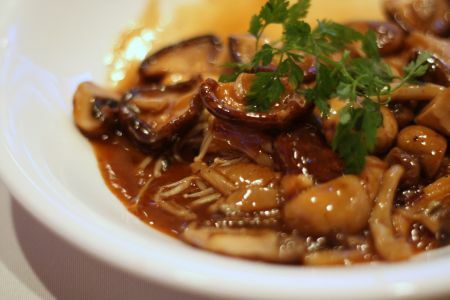 *Having a nice assortment of mushrooms creates a more interesting flavor profile and appearance as well. Want more delicious umami-packed recipes? Take your pick! Christopher Koetke is Vice President of both the Kendall College School of Culinary Arts and Laureate International Universities Center of Excellence in Culinary Arts. “Chef Chris” was named vice president of the Kendall College School of Culinary Arts in 2012. He joined the School of Culinary Arts in 1998, serving first as a culinary instructor and later as associate dean, dean and executive director. Chris began cooking professionally in 1982, and has worked in some of the world’s finest kitchens. He is a certified executive chef and certified culinary educator by the American Culinary Federation. Read more about his background on the About page. So I was interested in your scrambled egg concept of using MSG, but noticed that you prescribed milk mixed into it. A few months ago I heavily researched if eggs should have milk or not. The conclusion was that adding milk to eggs was bad. I think it would be worth you checking into that. Hi Cynthia, thanks for your feedback. Chef Chris likes adding milk to eggs because in the correct proportion, it adds lightness and fluffiness. Ultimately, it’s very much a personal preference. Happy cooking!